A personal friend and member of Augustine's community, Possidius, bishop of Caloma in Numidia, North Africa, during the late 4th and early 5th centuries, wrote the life of the great bishop of Hippo probably about 430. The monastic order called the Augustinians looked upon Augustine as their founder. This copy of Possidius's 'Life of Augustine' belonged to the Augustinian monastery at Kirkham, in North Yorkshire, which was founded in the 1120s. It would have been an important part of the community's library and may have been read from during some of their services to commemorate their founder saint. Accompanying the 'Life of St Augustine', several writings of the Church Fathers discuss the birth and life of the Virgin Mary and surrounding theological issues. There are also other saints' lives and excerpts which probably would have been read aloud during the meeting of the chapter or during the daily prayers, such as Matins. This page presents letters of St Jerome on the Virgin. 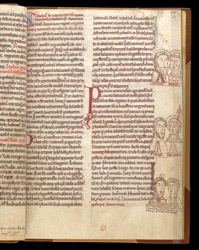 In the right margin, small drawings depict Anna and Joachim (the parents of Mary), Mary and Joseph, and Mary, mother of James (Mark 14:40), and Cleophas or Alphaus, father of James (John 19:25).